The spiritual disciplines (such as Bible reading and memorization, prayer, church attendance, service, tithing, and fasting) are used by God – when they are used by us – to mature us in our faith. Yet as important as consistent practice of the spiritual disciplines is, if our hearts are not in it, what our hands do matters very little! Than what the hands engage in. It always comes down to the “why” behind the “what” we are doing. If we are consistently engaged in the spiritual disciplines with our hands and feet, but with hearts that are not fully engaged, then we are engaging for the wrong reason and the results will leave us wanting. The heart is the “Christian Command Center,” and what rules the heart shapes the life. If we allow the spiritual disciplines to become little more than activities to check off on our “things-to-do” list as we go through our days, our hearts will grow cold toward Christ. It is only when we keep the why in view as the reason for the what we do that we will mature in our faith and begin to maximize the gifts, talents, and abilities God has given to us to expand His kingdom. Pastor and author Bryan Chapell wrote, “Spiritual change is more a consequence of what our hearts love than of what our hands do. The spiritual disciplines are important, but not as important as developing a heart for God.” I know from personal experience that it’s easy to get caught up in doing, doing, doing, without ever considering why we are actually doing it! When we keep this truth in view, our hearts beat with love for Christ; then, out of the love’s overflow, we engage in spiritual disciplines out of delight rather than duty. This is one of the reasons why we must remind ourselves of these truths of the Gospel not only daily, but moment by moment. A heart that beats for Jesus does what it does not to get something, but because of what it has already been given. We must regularly remind ourselves that . . .
Rather, it is His mercy. The favor of God is rooted in His goodness, not ours! So . . . what has your heart been beating for lately? If you have been engaged in any of the spiritual disciplines, have you asked yourself why? It is my prayer that throughout this year your heart and mine will beat more strongly each day for our Savior. That will mature us more than anything our hands find to do. Do you see that as a comfort to you today? Or do you recoil at this truth with fear and wonder? It is a thoroughly biblical truth that ought to give us great comfort. From the time he was 17 years old through age 30, Joseph received one “bad” surprise after another: hated by his jealous brothers for telling the truth . . . falsely accused by Potiphar’s wife . . . forgotten by an ungrateful cupbearer. Then came a different kind of surprise: in one day, Joseph was raised from the prison to the palace. Can the same be said about you today? Looking back over your life, can you think of a time that stands out as a season of struggle? A time when it seemed like God was either sleeping or on vacation? I certainly remember such times, and that is why, as has been so profoundly said, life needs to be lived backwards. It’s hard to see God in the storms that blow our way sometimes, but when we look back, we can see His handprints all over those trials. God not only sends the storms, He is in the middle of them with us! The sovereignty of God means there is a gracious purpose for our lives; and that purpose is being rightly accomplished, even in every painful providence. We may not see it, or understand it, at the time, but we can be assured that nothing ever catches our God by surprise. He is working all things together for our ultimate good (Romans 8:28). There are no surprises … there is great security in God’s sovereignty. I’ll have more to say on the doctrine of “the sovereignty of God” in my next blog. Did you know that it is God’s desire to dwell in the midst of His people? The Bible makes this clear both before and after the fall of Adam and Eve in the Garden of Eden. God walked with Adam and Eve in the cool of the day before they sinned, and pursued them when they were on the run after they sinned. Isn’t that simply amazing? God has said He will live with us and walk among us. What an encouragement that should be to all of us today! God is in our midst, no matter where He finds us. Whether we are celebrating at the summit or wavering under the waves of challenge, God is in our midst.
. . . He is in us. God is with us . . . for us . . . and in us. Is there anything we cannot overcome with the Master in our midst? Absolutely not! As Jesus told His disciples, “With God all things are possible!” (Matthew 19:26). We must hold fast to these Gospel truths! God’s presence is abiding in His people! The goal of Christian living is to make every part of our lives a showcase for our Savior, as we declare and demonstrate the transforming power of the Gospel of Jesus Christ. From the boardroom to the locker room to the school room to the family room, our lives should point to the One who loved us enough to die for us . . . the One who desires nothing more than to be with us for all eternity. One part of my ministry responsibilities is the privilege of performing weddings for couples in our church and community. Starting with pre-marital counseling, we spend a considerable amount of time talking together about the “stuff” of marriage and how to build a biblical foundation for the married and family life together. Sometimes I discuss the all-too-common prenuptials that many bring into their marriages today, even Christian marriages. Clearly, heading into a marriage with the end (divorce) in mind is not the way God intended for two people to become one flesh. God hates divorce (Malachi 2:16)! We must remember that the law of God was never intended to cause us to live an obedient life; it was graciously given to drive us to our knees at the foot of the cross. And if the law cannot save us, it certainly cannot sanctify us and make us more like Christ! It is a growing relationship with Jesus that leads to living a life of obedience, not a growing list of rules. Love needs no legislation. So . . . take some time to prayerfully consider your walk with Christ. Is it characterized by a growing list of rules? Or a growing relationship of love? Trying to legislate what love empowers people to do willingly is silly, foolish, and counterproductive. Keeping in view the love that was poured out for you on the cross will keep you moving in the direction of living a life that is pleasing to God and beneficial to all others. If we have received Jesus as Savior and Lord, we are no longer what we once were because of what He has done for us! We are a new creation, and that new creation is compelled by the love of Christ . . . not the law of God. Christ in Us Leads To Love And Love Needs No Legislation! The term weed is used in a variety of senses, usually centering around an undesirable plant that is considered to be a nuisance. In the spiritual sense, weeds are thoughts, words, deeds, or desires that disrupt or distort our Christian walk. Let’s take a brief look at the weeds of worry. The Bible says in Matthew 6:25-34, “Therefore I tell you, do not worry about your life, what you will eat or drink; or about your body, what you will wear. Is not life more than food, and the body more than clothes? Look at the birds of the air; they do not sow or reap or store away in barns, and yet your heavenly Father feeds them. Are you not much more valuable than they? Can any one of you by worrying add a single hour to your life? with the Lord Jesus Christ. And that is why He makes it crystal clear that, for the Christian, worry is to be recognized and removed. If God feeds the birds of the air and clothes the flowers of the field, and we are much more valuable to God than they are, what is there to worry about? Absolutely nothing! Besides, as Jesus reminds us, each day has more than enough trouble to send our way without our adding to it by worry! Worry robs us of our intimacy with Jesus because it puts our focus on ourselves, rather than on the One on whom we should focus: Jesus. The Bible states in 1 Corinthians 7:32-35 that one of the consequences of worry is that it distract us from the presence, the power, and the provision that God so bountifully will give us if we look to Him and lean on Him for meeting our needs. Worry is a lack of trust in God. We worry because we don’t trust God to make good on His Word. He has promised to meet all of our needs in Christ Jesus (Philippians 4:19); but instead of resting in that promise we become restless in our worry. God has never broken a promise in the past. Why would we worry about Him breaking one in the present or future? The key that keeps us from watering the weeds of worry is the Gospel. Standing in the shadow of the cross and fixing our eyes on our Savior cures us of all worry. If Jesus was willing to suffer and die in our place, will He not provide for our every need? Of course He will! You can’t love right unless you hate wrong. You can’t love good unless you hate evil. You can’t love flowers unless you hate weeds. Hate those wicked weeds of worry and refuse to water them! Pull them out by the root and rest in the reality of your redemption, knowing that your Redeemer lives – and He will care for you! What have you been fretting about lately? Notice I didn’t ask if you were fretting, because it is in the DNA of our sinful nature to fret! Yet Scripture clearly instructs that this is not for you. When God says something we should listen carefully; when He repeats Himself, we should listen very carefully! God tells us twice in the above passage not to fret, because He knows that fretting and faithfulness are like oil and water – they don’t mix well. In fact, as you’ve just seen, the Word of God states that fretting leads only to evil. When was the last time you fretted over the success of someone other than yourself? When was the last time you fretted over the “gain” received by evildoers? When we do things like this we work ourselves up, tear others down, and exchange faithfulness for fretting. God tells us not to fret, because He is in control of all things. Not even a sparrow falls to the ground apart from His will (Matthew 10:29). The sovereignty of God is a great comfort for the Christian, because we can be completely sure that what He has planned He will bring about; in the end all that is crooked will be made straight – and that includes you and me! Keeping our eyes on the truths of the Gospel is what will take us from fretting to peace and faithfulness. If we forget this we fret, and in our fretting we try to take control and make things right . . . which generally turns out all wrong! We can fret over the economy or we can be faithful to the One who has created all things and rest in His stability and strength. We can fret over the direction of our government, or we can rely on the sovereign power of God to revive His people and heal our land. We can fret over the terrorism throughout the world, or we can be look to the One who can bring down even the strongest earthly power and will one day make every knee bow before Him. There is so much God is calling us to do to expand the cause of His kingdom! That’s why it is evil for us to be filling our hours with fretting. Scripture commands us to “Be still, and know that I am God” (Psalm 46:10). And He has given us every reason to do just that. It’s only when we forget these reasons – the truths of the Gospel – that we allow fretting to replace stillness and faithfulness. Only the Gospel can take our eyes off the stuff of this world and keep them fixed on our Savior. We must continually remind ourselves that the day is coming when there will be no more pain, sorrow, tears, death, brokenness, sin, injustice, poverty, evildoers, and the fretting that springs out of this mess. Gospel truths are the keys that unlock the doors to lead us past our fretting and turn it into faithfulness. We have all heard the phrase “living large” used to describe someone living an extravagant or self-indulgent lifestyle. The phrase is often applied to someone who recently won the lottery or experienced some other financial windfall. When Jesus holds first place in our lives, we truly are living large, because we are living for Jesus – and there is nothing larger in life than living for our Lord. The problem is that we live in a world that has been possessed by its possessions. Many of us have bought into the lie that seeking “stuff” can seem functionally more life-giving than seeking our Savior. We are so easily satisfied by things that are smaller than Jesus! We find ourselves “living little,” focusing on the expansion of our own little kingdoms. Countless “little things” can seem more life-giving than living for the Lord, but their promise of life leads only to a slow and agonizing death. They can never and will never do for us what only Jesus can do. This was the essence of Satan’s promise to Adam and Eve who had been living large in the garden paradise of Eden. You and I can only imagine the beauty and perfection of that place! Yet our first parents quickly flung all that aside to squat in a mud puddle. Satan promised them “more” life apart from God; they quickly found out that Satan is a cruel, deceitful liar. He never has been able to deliver on his promises and he never will. There is no investment in this life as poor as investing in the expansion of the kingdom of self. If you and I are going to live large, we must pursue God’s will for our lives instead of our own will. It is there – when we are seeking first His kingdom and His righteousness – where we find meaning and significance . . . peace and security . . . purpose and passion. This is how we live a life that truly matters. This is the place where we expand the borders of our lives to fill the borders of the Kingdom of God, and that, beloved, is living large! When Jesus told us to seek His kingdom first, He was telling us that the life God designed us to live is a life rooted in Christ. Living for Christ must not be an add-on or an afterthought. Jesus is to be on the throne of our personal lives . . . our professional lives . . . in every area of our lives. He deserves that place and will tolerate no rival – nor should He. Make this year a year of living large, and you will not miss the one thing you were made for: Christ! Is there anyone reading this blog who doesn’t understand that sin is bad? We all know by way of personal experience that sin is bad. And the work of Jesus Christ on the cross reveals to us how appalling sin is in the sight of God. But is that all there is to say? Do we know just how bad sin really is? David rightly saw his sin as something far greater than rebellion against a set of commands. He saw his transgressions as something far more grievous than a violation against a moral code. He saw his sin reaching all the way to God – where it always reaches, because sin at its deepest level is a violation against God. To be sure, David knew he had sinned against Bathsheba, her husband Uriah, and as king, David had sinned against all the people of Israel. He rightly understood the nature of his sins as damaging countless horizontal relationships. But at the end of the day, the most important violation his sin had committed was the one against his vertical relationship with God. What makes sin so exceedingly sinful is that it is ultimately willful rebellion against a loving, merciful, and sinless God. It is only when we keep this fact in view – that our sin is a personal affront to God – that we will seriously set our hearts against our sins. Knowing that our sin is ultimately directed against God is the fuel we need to fight against our tendency to keep sinning against others. Perhaps, in some twisted way, we may believe someone “deserves” the sinful treatment we are delivering to them. But we can never regard God in that way! This is part of what I mean when I say we must keep the Gospel before us every day. God’s glorious Good News tells us that “God demonstrates His own love for us in this: While we were still sinners, Christ died for us” (Romans 5:8). Do we really want to continue to sin and thus thumb our nose at the Savior who left heaven’s throne to take up our cross? 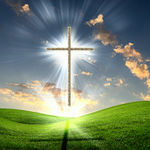 There was a time, as I was advancing through my seminary training, when I had turned Jesus into a doctrine in my mind. When I look back now, it’s almost hard to believe, but I turned Jesus into little more than the truths I had learned about Him. To be sure, they were great truths, and the truth sets the captives free. But now that I’m a lot older and a little bit smarter, I thank God He gave me the grace to see Jesus as more than a doctrine . . . more than a Baptist too! Wow! Do you catch the powerful relationship with Jesus that the disciples had? John said He and the other disciples had heard, seen, and even touched the incarnate Lord and Savior, Jesus Christ. Clearly, Jesus was more than a doctrine to them as they enjoyed fellowship with Jesus – and through Him, fellowship with His Father in heaven. He walked with them, He talked with them, He told them how they could have a right relationship with him and how they could have eternal life be His own, and the joy they shared is what we can all have as we come to personally know Him. Personally, I find it far easier to receive a Jesus who is Lord and Savior, walking on water, healing the sick, restoring sight to the blind, turning water into wine, and raising the dead to life. But a Jesus who suffered and died? Yet, this is what we see in His life and death. A Jesus who is able to sympathize with our weaknesses and willing to die for our sins? A doctrine could never do that. A theological proposition could never identify with us in any respect. Yet this is what Jesus has done for us. Jesus faced every one of our temptations: the temptation for self-rule, self-absorption, self-centeredness, self-confidence, and self-focus – and every sin that is bound up in all of these, yet He was without sin (John 8:46, Hebrews 4:15). He battled temptation in the wilderness. He battled temptation in Gethsemane. He battled temptation on the cross. Yet He never once yielded, because of His commitment to those whom He was born to die for. The person of Jesus Christ is a source of unimaginable comfort for every child born of grace. So . . . the next time you find yourself smack dab in the middle of a storm, or a wilderness experience, remember the person of Jesus Christ and His finished work He completed for you. Knowing that the Word of God became flesh and “tabernacled” among us for the perfect amount of time is to know enough to get us through anything we are facing. Jesus was equal to, yet distinct from the Father, and He refused to consider His glory as something to be clutched at selfishly (Philippians 2:6-7). Jesus emptied Himself by becoming a man, but not just any man. He became the God-man, the Servant of the Lord, the new and better Second Adam who chose to identify with sinful man, yet without sin, to one day remake man sinless forevermore. Do you really know Him personally, powerfully, and practically? Doctrine can inform you heart and instruct you in the way of righteousness; but only a personal saving knowledge of Jesus can make you what you need to be before God!